The following figure depicts the measurement system overview, showing the path of real-world physical phenomena to your measurement application. Sensors and transducers detect physical phenomena. Signal conditioning components condition physical phenomena so that the measurement device can receive the data. The computer receives the data through the measurement device. Software controls the measurement system, telling the measurement device when and from which channels to acquire or generate data. Software also takes the raw data, analyzes it, and presents it in a form you can understand, such as a graph, chart, or file for a report. NI measurement devices and application software are packaged with NI-DAQmx driver software to program all the features of your NI measurement device such as configuring, acquiring, and generating data from and sending data to NI measurement devices. Using NI-DAQmx saves you from having to write these programs yourself. Application software, such as LabVIEW, LabWindows™/CVI™, and Measurement Studio, sends the commands to the driver, such as acquire and return a thermocouple reading, and then displays and analyzes the data acquired. You can use the NI-DAQmx driver from NI application software or from any programming environment that supports calling dynamic link libraries (DLLs) through ANSI C interfaces. 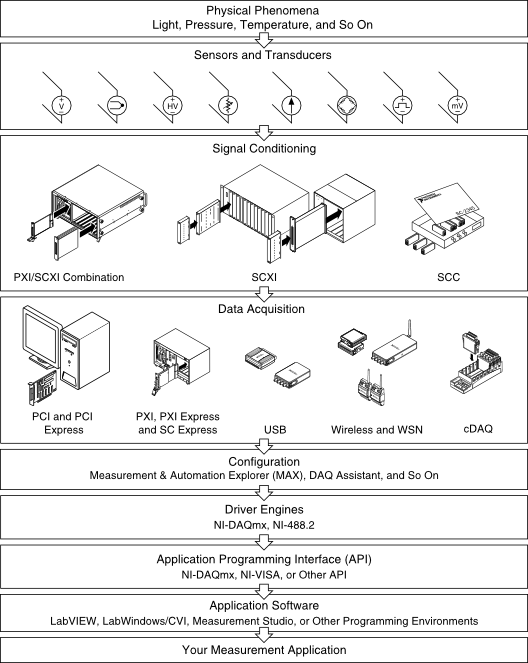 Regardless of the programming environment, your DAQ application uses NI-DAQmx, as shown in the figure.